We’ve visited Porto’s before, and we’re certainly no stranger to either steak sandwiches or tortas. The last Porto’s sandwich featured here was a rare miss from an otherwise exemplary sandwich shop and bakery, and it’s nice to showcase a sandwich that really points out how much the establishment shines when it plays to its strengths. 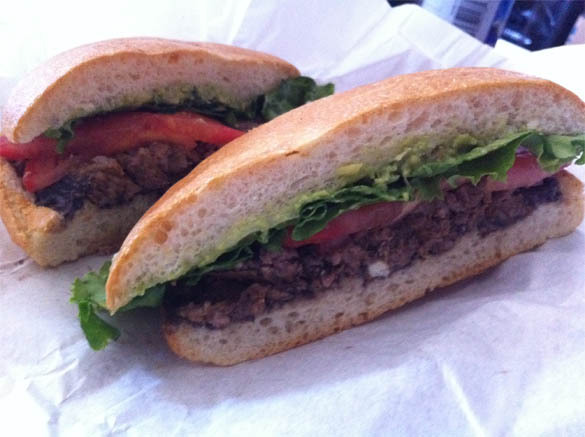 The steak torta is grilled steak, cotija cheese, guacamole, lettuce, tomato, and black bean spread on a French round. The bread, baked in-house, is marvelous. The grilled steak is flavorful, even though it is the normal torta-quality steak you would expect. The true star of the show, however is the black bean spread. Porto’s uses this on several sandwiches, and the first time I took a bite of one, my mind burst into a fire of one vital question: “WHY ISN’T THIS ON EVERY SANDWICH?” The black bean spread is something that, as soon as you taste it, you wonder why you haven’t thought of it before. It adds a welcome earthiness and savoury element that so many unneeded vegetables can only hope to aspire to. This sandwich is nothing short of a delight, a wonderful balance of creaminess, firmness, and a wide flavor palate. The bread holds everything together perfectly and although the cheese may be a bit lost, you’ll find the experience pleasing in every way. This entry was posted in General Sandwich Discussion, Sandwich Reviews and tagged Los Angeles, Reviews by Bill, Sandwiches I Have Eaten, Steak, Torta by bengrimm. Bookmark the permalink.